This beautiful, privately owned beach home is ideal for family get-togethers, reunions with friends or even a relaxing weekend away from the city. Its bright beachy decor puts everyone in a relaxed mood. The house takes in the soothing ocean sounds & catches the breezes off the gulf. The yard is beautifully manicured and ideal for games, water slides & cookouts. The kitchen is fully equipped, allowing you to cook, grill, or enjoy a chilled bottle of wine. The house is just one block from the beach. It is located in the prestigious Pirate's Beach community where the beaches are well groomed. The home includes a BBQ grill, outdoor shower, patio & deck furniture, large flatscreen TV w DVD, and CD/Tuner Stereo System in living room. Great location for a beach vacation & only a 10 minute drive to Schlitterbahn or Moody Gardens. The home is an enjoyable non-smoking vacation home and you must be at least 25 yrs of age to rent this home. I love the beach. I live just down the street in Houston. I am a Construction Manager. This is my week end get-away. Fishing, walking the beach, enjoying the sunset, it's all here. Two minute slow walk to the beach. Private beaches, safe at night. Quiet safe neighborhood. Lots of beach combers, boating, fishing walking, toes in the sand stuff. Restaurants nearby. Downtown is about a 15 minute drive up the beach. The property is 3 minutes walking distance from the private beach. Great beach house! Very clean and good location. Owner was very quick to respond to questions. The owner responded to emails and phone calls promptly. The house was perfect for the weekend getaway for 6 adults. The large front balcony was perfect for hanging out and visiting and enjoying the sunrise with a cup of coffee. The only downside was the 1/2 bath downstairs wasn't working, but we had no real need to use it. The house was clean and kitchen had all the things necessary for cooking. This was my first time to stay in a beach house, and I liked it! The property was clean and well-maintained, and the neighborhood was nice and quiet. The owner was good about returning emails, and I would recommend this property to a friend. While you cannot see the beach at all from the house, it is only a couple blocks walk. The beach itself is blocked off to cars, but you can drive and park by the barrier posts. The beach was clean and not crowded. The house was clean and had three bedrooms, all with ceiling fans. BR1 has a full size bed and a bathroom with a shower. The description of the house was accurate except for there is no queen bed, and no third (working) toilet, neither of which was a problem for us. BR2 has a king bed. BR3 is another full bed. There is a second bathroom/shower in the hall. The outdoor shower downstairs worked, but was a little hard to get to. We used the water hose to rinse off instead. The downstairs toilet, in the laundry room, was sealed closed with duct tape, but the washer and dryer worked great. The kitchen was clean and had a few basic pans and utensils. We did not use the bbq pit. Living room sofas were nice and comfortable, and there was a flat screen tv on the wall with cable. The wi-fi worked great, and so did the a/c. It was a very relaxing week. We slept in, did touristy stuff during the heat of the day, then went to the beach in the evenings. Fun touristy stuff in Galveston includes Moody Gardens, Schlitterbahn, Pleasure Pier, the Strand, Bolivar Ferry, etc. And possibly the Galveston Walmart, if you are into people watching. Tips for if you go: stairs are a little hard to navigate for older people. There is a pantry and kitchen so bring food, and bring dish soap. Bring plenty of towels, for the beach and showering, and bring detergent. Bring CDs for the stereo. Bring jelly fish sting reliever. Bring extra pillows and blankets. The beds are not the most comfortable, but they were ok. The owner asked that we leave it the way we found it, which we took to mean clean it up and wash the sheets. There is a broom, vacuum cleaner, and plenty of cleaning supplies at the house so it was not a problem at all. We had a wonderful time! Nearby activities include the country club pool, golf, tennis courts, playground, marina, fishing & boat ramp. 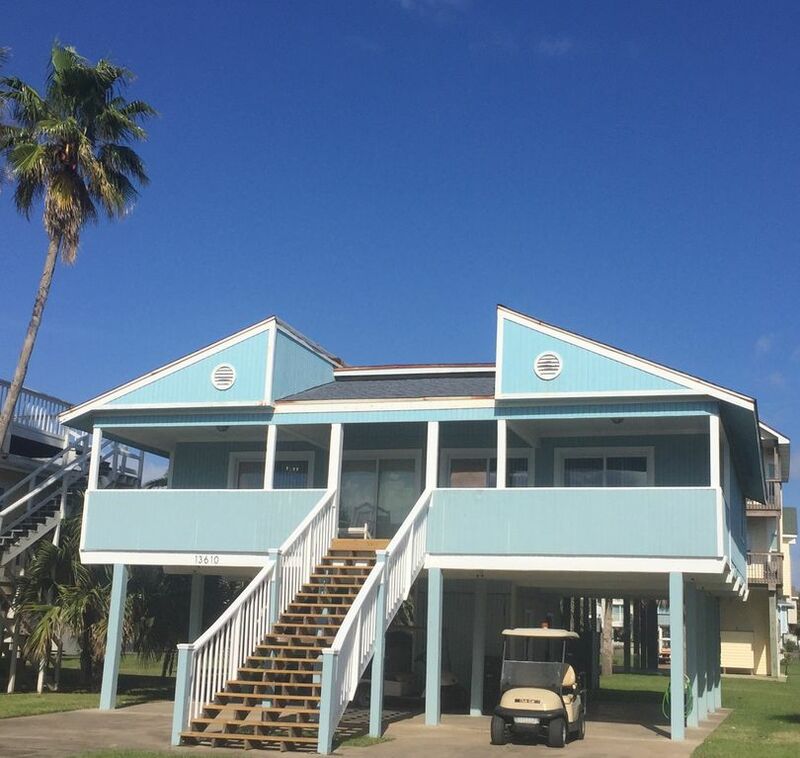 Located just 7 minutes to the seawall are Putt Putt Golf, Bungee Jump, Batting Cages, Fishing Piers, Movie Theater, Galveston Municipal Golf Course. Moody Gardens is 12 minutes away & offers The Rainforest Cafe, Pyramid, IMAX 3D Theater, Palm Beach, Discovery Museum, Ridefilm Theater and the Aquarium Pyramid. Schlitterbahn water park is 10 minutes away. Nearby Galveston Island Strand and Historic District offers art galleries, unique shopping, & upscale dining. For an afternoon excursion visit the Kemah Boardwalk, NASA, and Gulf Greyhound Race Park. Nightly Rate: $250 - $300 Weekly Rate: $1200 - $1500 Monthly Rate: $4000 - $6000 Peak Season March to September $ 280 Per Week Night $ 700 Weekend (Fri - Sun) $ 1500 Full Week (Any Seven Days) Off Season September to February $ 200 Per Week Night $ 500 Weekend (Fri - Sun) $ 1200 Full Week (Any Seven days) Call or Email for Holiday Rates.